Myappart Home is located in Colombes, 14 km from the centre of Paris. 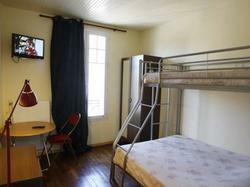 It offers studio accommodation with free Wi-Fi internet access. Each studio includes a kitchenette equipped with a micro-wave oven, washing machine and iron. Myappart Home offers a cleaning service once a week. The Colombes RER Train Station is one 1km from the residence, providing access to the capital's many sites. La Défense is 4 km away.